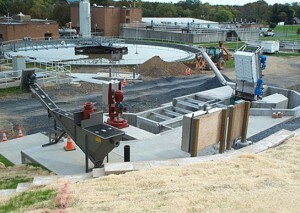 The Carlisle Borough Regional WWTF is a 7 MGD, two-stage activated sludge, wastewater treatment facility. The original WWTF had no screening or degritting facilities. The influent wastewater entered the facility through a deep gravity sewer into the raw wastewater lift station, which pumped the influent flow into a distribution box for the primary clarifiers. Prior to pumping, the wastewater flowed through two grinder units that shredded large inorganic solids into pieces that would not interfere with the pumps. The primary clarifiers were tasked to remove the grit and shredded debris pumped from the influent wet well. But heavy grit and debris would accumulate in the wet well necessitating a periodic clean-up that was both expensive and unpopular. To correct this problem, Carlisle instituted a two phase upgrade of the influent lift station and headworks. First, a Duperon flex-rake screening unit and Pista-Grit degritting unit were installed upstream from the primary clarifier splitter box. 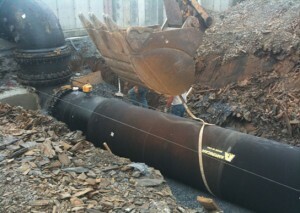 This was accomplished by diverting the influent force main to a new headworks channel with the two new treatment units. The headworks channel incorporated automatic bypass gates that allowed peak flows to be diverted around the degritting unit so that removal efficiencies would not suffer due to storm flows and the degrit unit could continue to treat its design maximum flow during these maximum flow events. Phase two placed a Stemdrive compressed air driven mixing system into the wet well to prevent the deposition of grit and debris, allowing them to be pumped to the new headworks facility for removal. The Stemdrive compressed air mixers were selected since they were intrinsically safe in the possibly combustive environment and due to the lack of moving parts in the system, which promised low maintenance.